age 91 of Algonac, MI., died July 19, 2014 in her home. Bea was born on a gold claim in Paradise, CA. in 1923. She was raised in Greensboro, NC by a “Yankee Mother and a Southern Gentleman.” After attending the University of NC College for Women, she married Lt. Earl Sands in her hometown on January 2, 1945. After the War, they resided in northwest Detroit for 25 years, raising 4 “Baby Boomers.” She and Earl relocated to Algonac in 1972 to enjoy the St. Clair River and watching the boats. Always involved with crafts, Beas became accomplished in ceramic art while living on the River. “Bea Bells,” and the unique melodies of her wind-chimes, were heard at the Algonac art Fair for more than 30 years, and she later became their 1st featured artist. She was a long time member of St. Catherine’s Catholic Church, active in fundraising events with the Ladies Guild, most notably with her part in their many popular hand-made quilts. Like others of the “Greatest Generation,” she experienced the depths of the Great Depression and witnessed tremendous changes throughout her lifetime. Her lifelong motto, “Accept and Adjust,” is part of her legacy cherished by family and friends. Bea was preceded in death by her husband of 53 years: Earl E. Sands; parents: Paul and Ina Pearson; brothers James and Paul Jr.; sister: Martha P. Hyde; and her many beloved pet dogs. 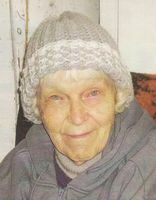 She is survived by four children: Edward Michael, Martha, Matthew, and Paul (Jan); 10 grandchildren (to whom she was “Nana”); Christopher, Sean, Andrew, Corey, Travis, Solomon, Kimberly, Derek, Jonathan, and Justin; 14 great-grandchildren: Zachary, Alayna, Brandon, Alex, Logan, Colin, Brennan, Nicholas, Wesley, David, Shelly, Bryden, Justin, and Ana; 1 great-great-grandchild: Sophia; and long-time family friends and “adopted daughters:” Judy Sands and Laura Hughes. Mrs. Sands will be instate at 10:30 AM Wednesday, with Mass at 11:00 AM in the Our Lady on the River Parish St. Catherine’s Catholic Church, Algonac. The family honors the memory of Bea with a visitation from 6-9 PM Tuesday in the Gilbert Funeral Home, Algonac. In lieu of flowers, memorials appreciated to the following organizations: Algonac-clay Historical Society, Sanilac County Humane Society or the Michigan War Dog Memorial.